We’re closing out 2015 with not one, but TWO holiday shows! One for grown-ups and one for the whole family. Based on the autobiographical David Sedaris short story of the same name,The Santaland Diaries creates a brilliant evocation of Christmas as seen from the other side… through the eyes of a Macy’s elf. Our hero confronts the screaming children, bossy parents, flaky elves and apathetic Santas with hilarious results! Season’s Greetings continues the hilarity as a woman reads an annual Christmas letter sent from a family friend describing the unraveling of her year in a hysterical and twisted fashion that could only come from the imagination of Sedaris. 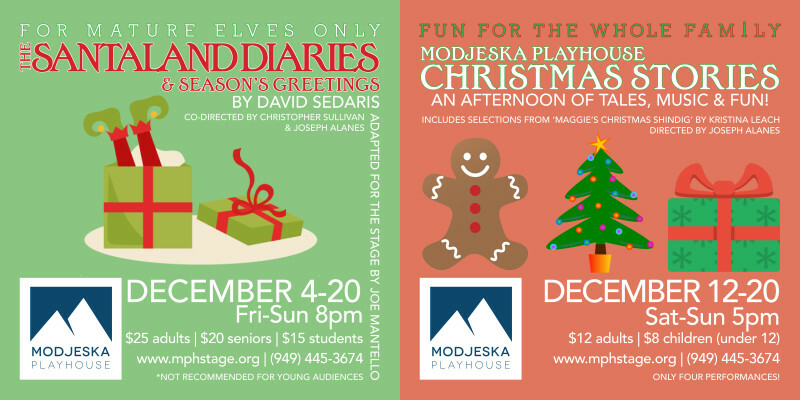 Opens Friday, December 4 and runs thru Sunday, December 20; Fridays, Saturdays and Sundays at 8 p.m.
Come to Modjeska Playhouse for a festive afternoon of holiday tales, music and fun for the entire family! Our very first family Christmas show includes three short plays, holiday music interludes and hilarious sketches that will get you excited for the holiday season. ONLY FOUR PERFORMANCES! Opens Saturday, December 12 and runs thru Sunday, December 20; Saturdays and Sundays at 5 p.m.